Ty Black is congratulated by teammates after blasting a home run to left center. Prior to last season, Lilly Conrad Chiropractic/American Legion dominated the Greater City Baseball League by winning championships in 13 of 14 years. Locker Room put an end to that amazing streak in 2017 and is on the verge of winning its second title in a row. Locker Room pounded Lilly Conrad, 11-4, Monday night at Vets Field to go two up in the best-of-five series. Game 3 is scheduled tonight at 6:15 p.m. at Vets. “Hopefully, we can end it in 3,” Locker Room manager R.J. Barnard said after Monday’s victory. Locker Room exploded for five runs in the top of the second inning to chase Lilly starter Derek Younker. Back-to-back doubles by Kevin Scholly and Mason Hershey opened the inning. Later, Andy Lytle hit a sacrifice fly and Tyler Stiffler contributed a two-RBI single. Before the night was over, LR had 11 hits, including homers by Ty Black and George Roberts and five doubles. Black’s two-run shot over the left field fence made it 8-3 in the fifth and Roberts ended the scoring for LR with a two-run blast in the seventh. 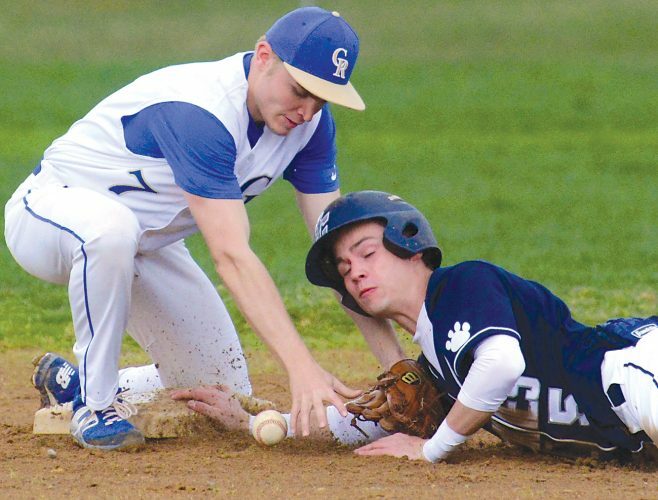 “George (Roberts) crushed one late but Ty’s was huge for momentum,” Barnard noted. Cam Kyle went the distance (103 pitches) for the victory, giving up 10 hits, including three to Ryan Ickes, who homered for the losers. “Sometimes I show up and I’m not feeling great,” Kyle admitted. “It’s important to get a cushion because it changes momentum for everyone,” he said of LR’s five-run second inning. Lilly Conrad used five different pitchers in an effort to shut down Locker Room. “Younker has been battling arm issues,” Lilly player-coach Lucas McCoy said of his starter. “We knew he’d give it his all but he didn’t have his best control. “Plus, they were crushing the ball,” McCoy noted. “We had our chances but, against this team, you can’t leave guys on base. They are too good to let opportunities slip by. LOCKER ROOM (11): Weibley cf 310, Martinez 1b 502, Roberts 3b 411, Scholly 2b 412, Mason Hershey c 522, Matt Hershey rf 321, Slagenheit rf 000, Lytle dh 000, Kyle p 000, Black lf 321, Stiffler ss 322. Totals — 30 11 11. LILLY CONRAD CHIROPRACTIC/AMERICAN LEGION (4): Matish cf 301, Bracken cf 101, Gallaher 1b 300, Sinclair 3b 401, B. Ickes 2b 411, Porter rf 301, Walters pr 000, L. McCoy ss 400, C.J. McCoy dh 302, Younker p 000, Smith p 000, Wakefield p 000, Weyandt p 000, Fabbri p 000, Gully c 300, R. Ickes lf 433. Totals — 32 4 10. E–Slagenheit, Sinclair. 2B–Martinez, Scholly, Mason Hershey 2, Stiffler. HR–Roberts, Black, R. Ickes. RBI–Weibley, Martinez, Roberts 2, Matt Hershey, Lytle, Black 2, Stiffler 2, Gallaher, B. Ickes, C.J. McCoy, R. Ickes. WP–Kyle. LP–Younker. SO–none. BB–Kyle 1, Younker 1, Smith 2, Wakefield 1, Weyant 2, Fabbri 1. 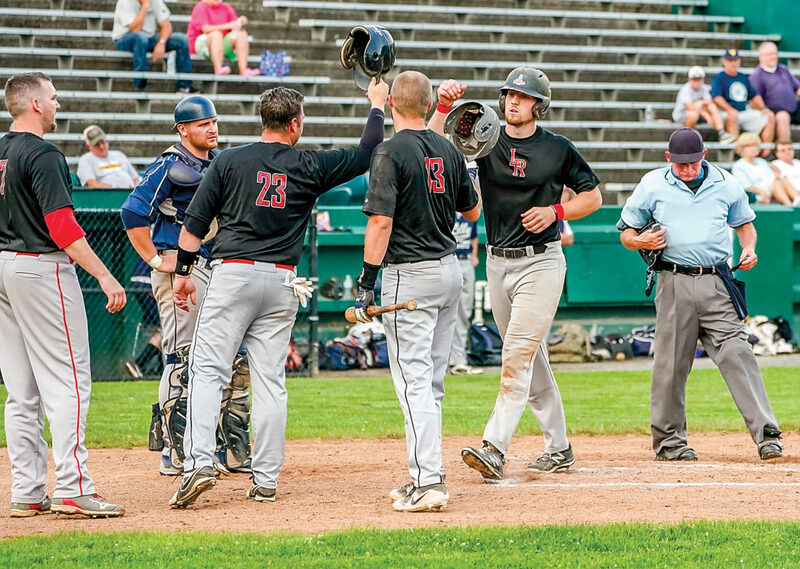 Umpires — Joe Thompson, Dave Adams, Joe Bidoli Jr.
Locker Room leads best-of-5 series, 2-0.